I’m the Digital Analytics Program Manager. On an average day, we have millions of page views and visits to our website and mobile apps. It’s my responsibility to make sure that all of those “hits” and “visits” are gathered correctly to be put into our data warehouse system. From here, the data is processed and tied together with the data from other systems for our Information Delivery team. The data has to be super accurate so that our teams get the real picture of what our traffic is doing so they know where we need to focus our efforts to improve the site and/or mobile apps. I usually get going by responding to emails and checking-in on the data transfers to our data warehouse systems. Next, I’m on to meetings and my task list which has me working with various website and mobile teams. We work on different projects, but the goal remains the same, to give these teams options that will help them achieve their stated goals. At the end of the day I take my pre-workout. My favorite is PEScience High Volume Paradise Cooler. While I wait for it to kick-in, I wrap up any lingering issues before hitting the company gym for a workout session. Brandon's desk is nearly taken over by his supplement collection. I make sure that the traffic information is accurately gathered. This is crucial to determining if we are really helping our customers reach their health, fitness, and appearance goals. So, everyone please track your workouts and stats in either the BodySpace App or on the website so that we know we are helping you. If there ever is an occasion where I need a little extra boost, I visit HQ’s lobby. A total motivator for me is our commitment wall signed by anyone who visits the office. Walk down the hallway and both sides of the wall are covered with customer and team member transformations (including my own). Seeing those images are a powerful reminder of why we are here and why we need to not only do the best we can, but make the big idea bigger! You have to be committed to providing each and every visitor with the best experience and have a helpful and positive attitude. I’m here because of the people and culture. Within 45 seconds of walking in the door for my first interview, the customer-centric, entrepreneurial, and contagious excitement for changing people’s lives was palatable. You could feel it oozing out of the people, walls, lights and computers! My decision to work here was made before my interviewer even uttered his first word to me. Luckily they liked me and here I am! I’m proud of the thousands upon thousands of before and after pictures of people that have changed their lives and the unbelievable amount of thank-you messages and positive reviews that we get on a daily basis. I have no choice but to be honored and very humbled that I get to be a part of such a life-changing organization. This is the only company that I have ever been with that has such a stellar work environment and the most passionate, helpful, kind, caring, athletic, and driven individuals. Really, I can only pick one? Ok, if I have to pick one, it would be the quarterly team building. Most recently Business Intelligence and the Marketing crew teamed up for a fun day of golf and lunch - we work hard, but then we play hard! The bodybuilding.com teams hit the green for a day of mingling and making new friends. In a word, phenomenal. It’s like I have been adopted into an extended family - I call it my Bbcom Fam. A couple of us took a 10-hour drive in my pickup to go deep-sea fishing for albacore tuna. We also took a minor detour for some Texas BBQ. Another one of my co-workers was the best man at my wedding (before we both worked here). A weekend well spent with co-workers catching big tuna. Sushi anyone? Before I worked here, I thought it was just a supplement site. Now, it is not only my resource for workout programs, but my wife and I also try the recipes! My favorite “collection” so far is 7 Foolproof Protein Sweets. 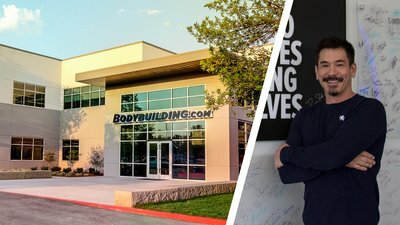 I just celebrated my fourth year here at Bodybuilding.com. In those years, I have entered 3 of the employee Transformation Challenges because I love seeing my body change with the right nutritional plan, exercise plan, and 12 weeks of consistency. As it turns out, the third time was the charm because I won the “Male 40 and Over” Category! Left to right. Brandon's hard work displayed on bodybuilding.com's transformation hallway. Brandon's final 2016 transformation. I enjoy boating, skiing, waterskiing, fishing, wake surfing, soccer, flying radio controlled models, golf, ping pong, fun runs…I guess you could say I like staying active. I have waterskied on Idaho waterways 10 out of the 12 months of the year. December and January were pretty cold runs! My favorite training program is Dr. Jim Stoppani's Shortcut to Size. If you are looking for a new training plan or want to switch up your workouts, you have to try this! I spent 1.5 years driving a semi-truck hauling oversized and overweight cargo, like power transformers and construction equipment. During that time, I was supposed to be the best man in my friend’s wedding. Unfortunately, there were some traffic and scheduling issues and I almost missed the wedding. I drove my truck right to the church, jumped into my tux, and took the wedding pictures. We even took a picture of all of the guys in front of my truck! The best man rolls up in his semi-truck, circa 2000. Thanks Brandon! We Are Happy To Have You At Bodybuilding.com!